October 23, 2014 • Filed under Press Releases. 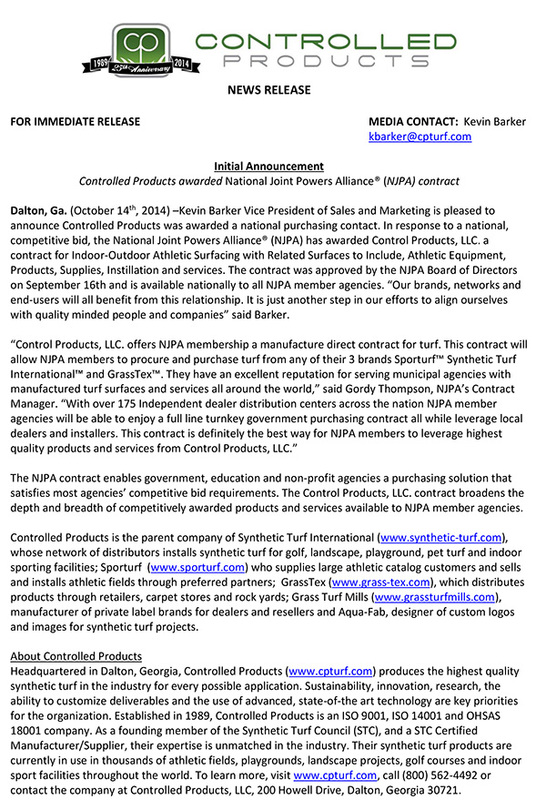 Kevin Barker Vice President of Sales and Marketing is pleased to announce Controlled Products was awarded a national purchasing contact. In response to a national, competitive bid, the National Joint Powers Alliance® (NJPA) has awarded Control Products, LLC. a contract for Indoor-Outdoor Athletic Surfacing with Related Surfaces to Include, Athletic Equipment, Products, Supplies, Instillation and services. The contract was approved by the NJPA Board of Directors on September 16th and is available nationally to all NJPA member agencies. “Our brands, networks and end-users will all benefit from this relationship. It is just another step in our efforts to align ourselves with quality minded people and companies” said Barker. The NJPA contract enables government, education and non-profit agencies a purchasing solution that satisfies most agencies’ competitive bid requirements. The Control Products, LLC. contract broadens the depth and breadth of competitively awarded products and services available to NJPA member agencies.Controlled Products is the parent company of Synthetic Turf International (www.synthetic-turf.com), whose network of distributors installs synthetic turf for golf, landscape, playground, pet turf and indoor sporting facilities; Sporturf (www.sporturf.com) who supplies large athletic catalog customers and sells and installs athletic fields through preferred partners; GrassTex (www.grass-tex.com), which distributes products through retailers, carpet stores and rock yards; Grass Turf Mills (www.grassturfmills.com), manufacturer of private label brands for dealers and resellers and Aqua-Fab, designer of custom logos and images for synthetic turf projects. contact the company at Controlled Products, LLC, 200 Howell Drive, Dalton, Georgia 30721.